Retronitus - Noise from the past! Well, luckily i've been able to somewhat fix this issue myself. Also, attached is a little tune I started to cover to get more familiar with writing music for Retronitus. I'm thinking of finishing the cover, because why not? A virtual cookie to anyone who recognizes (the beginning of) the tune, I guess. Darn! The Mac doesn't seem to know what to do with an MKV file. It's a video file. I'd recommend VLC Media Player. But don't worry, it's almost done! And when it's done, I'll of course post the code. Also, here is an mp3 (once again, in a zip) of what I've got now. This is about 50% done. If anyone has any ideas on how to improve the instruments, I'd like to hear them. Also, I'm not quite happy with the brass thingy. It can be a little grating, can't it? It is played by two Square channels, one octave apart: SQW_BRASS1 is played by the higher pitched channel. Can retronitus import some mod or other format? I'm just transcribing from a MIDI by manually entering the note deltas and pattern sequences into a Spin file. I think I will post my code within the next 24 hours, so you'll be to see what that looks like. Also, here is an mp3 (once again, in a zip) of what I've got now. Thanks for the MP3. This sounds great! For this tune, i slightly modified Retronitus to support simple panning and out-of-phase/surround mixing. However, to do this I had to reduce the sample rate. I chose 64 kHz. I could have gotten away with a higher rate, but 64kHz is not only a nice 1.5 multiple of 48kHz, but also leaves me some headroom if I want to add further bloat to Retronitus. 3x Square wave with PWM - drawn as green in the video, all panned to the center. 3x Sawtooth wave with strange modulation - drawn as white, red and yellow in the video, panned to the left, right and surround-back, respectively. 1x Triangle wave - drawn as purple in the video, panned to the center. 1x LFSR Noise - Not used in this tune. 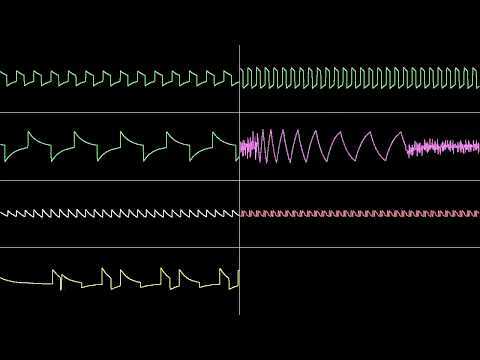 The oscilloscope view was created by muting all channels but one and then recording just that channel. Repeat this for all 7 channels (the NOISE channel isn't used here), of course. Then I used a fork of SidWiz2 (available here: https://github.com/Pigu-A/SidWiz/releases ) to create a video from them. The audio you hear, however, was of course recorded in one go and in no way post-processed (except for normalization). Also, the data for this tune takes only 4028 bytes! Less than 4K! The Retronitus synthesizer is another 1700 bytes, though. Wow! That's fabulous! Are you saying this is all done with a single COG? Amazing! Maybe I can use it to drive the speaker in the WordFire/Quby console. It's only monophonic though. Is there a way to mix everything down to a single pin? Actually, I suppose that would negate your good work of placing the instruments in a stereo field. Getting it to run on the Quby should be as easy as ripping out the stereo mxing and just adding all the sound into one pin. However, channels that are only mixed to the left or right are only half as loud as ones mixed to the center or surround channel But it seems to sound better with all the channels mixed at the same volume? Whatever. Know what? I'm going to rig up a mono version for you real quick! Here you go! This is my tune and mono 64kHz Retronitus (with half of the surround mixing code still in there....) preconfigured for the Quby. It should(tm) just work. Unless there is some guff that needs to be done to enable the amplifier? Thanks, I’ll try it in the morning. I have made a tool that can convert amiga mod files to Retronitus. All you have to do is to make Retronitus instruments that maps to each sample using the built in instrument editor. It kind of works for simple mod files without too much fx. It's still a very early version and it has got som bugs that needs to be fixed. I'd love to see that MOD converter! I just tried this. All I did was compile it with the command "openspin main.spin" and then loaded the resulting binary. I hear a little crackling from the speaker but no music. Is there something else I need to do? I think that should enable the amplifier at full volume? Although that may be too loud? I tried that and I'm afraid it had no effect. No clue then. Is there any code that does produce proper sound that you can show me? Thanks for trying to do this for me. I'll try to track down some sound code for the WordFire/Quby console. the beeping loop leaves pin 21 high! Okay, that works. It doesn't sound anywhere near as good as your MP3. Maybe I should try this on a board with stereo output. What output circuit do you recommend? I'd try setting FRQA to a different value. Maybe the speaker is being overdriven? Although in retrospect, I'd increase the value of the highpass/AC-coupling capacitor to get better frequency response. Note that I used "audio-grade" electrolytics for the 47uF ones and foil capacitors (=not microphonic) for the 10nF ones. Not sure if that really improves anything, but eh. Thanks for the circuit. What value coupling capacitor would you use? I tried setting FRQA to $0800_0000 and the volume got lower but the sound quality didn't improve.